Virgin Australia: A decade of international services. Today marks ten years since Virgin Australia (Blue at the time) launched it’s first international flight, DJ007 between Christchurch and Brisbane on January 29, 2004. Across the Tasman, Virgin’s competitive bullseye wasn’t locked squarely on the Qantas Group, it was also taking on a newly relaunched and reinvigorated Air New Zealand in its highest yielding market place. Pacific Blue grew quickly, leveraging the opportunity to develop reliable low-cost air services to the remote, developing islands of the Pacific, an area of the world that couldn’t support the high-cost operation of either national carrier. Virgin’s long-haul ambitions came to fruition in 2009 – the worst time to launch an international airline, but it had little choice – with the launch of V Australia services to the US. AA’s inaugural A321T service. Image: Edward Russell. This week Australia’s mantle for offering the best transcontinental airline product in the world – which Australian’s unjustifiably love to pick apart as woefully inadequate – was challenged for the first time in perhaps two decades as American Airlines launched its new premium A321T service from New York JFK to Los Angeles. Compared with the past decade of woefully inadequate product offer onboard American carriers, the product reinvention is a welcome return to the days of glamorous transcon air travel. There will be a 30 per cent increase in the number of first class seats AA offers as business class and economy decline by 13 per cent and 27 per cent respectively. Continued capacity rationalisation carries through to the strategic relaunch with AA’s total New York-Los Angeles capacity decreasing in favour of frequency growth from ten to thirteen services daily. Looking to the sky in 2014. A350 MSN2 the first test aircraft to be fitted with a full cabin interior in its new carbon fibre scheme. Image: Airbus SAS. Some big regulatory changes will take place in 2014. In particular, CASA will need to guide the Australia’s airlines on the use of Personal Electronic Devices (PEDs) following changes to regulatory legislation by the FAA in the US and EASA in Europe. Currently Australian carriers are self regulating in this respect, but moving independently as a way to gain competitive advantage will only create headaches for crew in enforcing use on-board. The war will continue until the end of the first half, bringing further revenue pressure to the Qantas and Virgin groups. Qantas has invested too much the public rhetoric behind in its strategy, to back away now would look like it was giving in. Not the best market image to present given its current financial position. Expect the Federal Government to make small changes to the level of single foreign ownership to the Qantas Sale Act. The political future of Tony Abbott’s Government depends on their ability to deliver a courageous bipartisan policy decision. With a promise of a decision, a ‘government of no surprises’ will now need to deliver with a real commitment on Badgery’s Creek. This will come as a stage 1 single runway development, with no rail connection, because Abbott’s made it clear he doesn’t like trains. Also expect a change to the slot caps at Sydney Airport, starting with the 05:00-06:00am landing window. Carry-on’s top 13 of 2013. The most exciting new aircraft in years became known for one thing in 2013: fire. In January the worldwide fleet was grounded – only the second aircraft since the DC-10 to be grounded in this way – following a series of electrical faults and battery fires caused by thermal runaway. The batteries were pulled out, boxed, and additional venting at a cost of approximately $500,000 per aircraft. Back in the air confidence has grown, the 787-9 is now flying and there has only been a small fiery issue relating to a locator beacon. Image: Richard Deakin. 110 years later Bombardier did it again for the very first time. This time with the first completely new narrow-body design since the A320 family. ICAO’s member states reached a landmark multilateral agreement to develop a market-based measure that would reduce carbon emissions by 2020. The agreement will allow countries and airlines to operate under a single global standard rather than competing carbon regimes. Governments’ individual plans will be approved at the next assembly in 2016. #keeptail or #switchtail? Doug Parker doesn’t care. Qantas Fleet Review: A different look at an all Boeing affair. 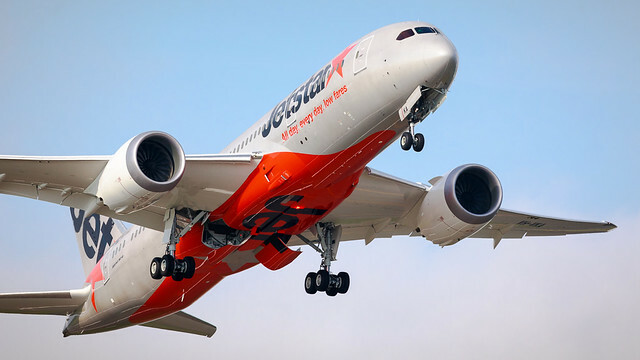 Qantas’ Sydney Jet Base hosted a Qantas Group fleet review on the weekend to showcase Jetstar’s new Boeing 787-8. An all Boeing affair, on display were 717 VH-NXG, 737-800 VH-XZB, 747-400 VH-OJM, 767-300ER VH-OGG, and 787-8 VH-VKA, with unprecedented access to explore the aircraft. Taking over the world one A380 at a time. No longer a dream. Jetstar’s first 787. Almost seven years after the order, and five long years of delays, Jetstar’s first Boeing 787-8 is here. Well, almost. It will be at 1305 AEST on Wednesday October 9. © 2019 CARRY-ON | Aviation commentary that won't fit in the overhead locker.